Vanderlande’s PAX OPTIMA combines state-of-the-art automated screening lanes with a well-established remote screening software and life-cycle services to create a fully integrated checkpoint solution. Already deployed in multiple airports worldwide, the solution has proven its capacity to significantly improve the efficiency of airport terminal operations, and more specifically of the passenger screening process. In traditional security checkpoints, passengers divest their belongings one after the other, move forward to a walk-through metal detector, and then reach the reclaim area where they wait for their carry-on luggage to be cleared. X-ray images are analysed locally by a screening agent and suspicious items are manually transferred to the search agents at the end of the lane. When the screening is complete, agents stack the empty trays and manually bring them back at the start of the lane. At busy times this can result in a shortage of empty trays and passengers waiting longer than necessary. In such a scenario, the lane’s belt is also often stopped to provide the screening agent with sufficient analysis time. Passengers that are slower to divest or require more time slow down the entire screening process. Fully modular, the screening lane can be adapted to an airport’s need and to the space available at the checkpoint. With an automated screening lane, the process is made more efficient from the starting point as multiple passengers can divest their belongings simultaneously and at their own pace without affecting others. If their trays are cleared, they can then collect their possessions at the reclaim area and continue their journey. Meanwhile, the X-ray images and pictures of the trays are sent to screening agents located in a remote screening room. There, agents can observe X-ray images coming from any lane, away from the checkpoint. If a tray is deemed suspicious by the remote screener, the screening lane automatically diverts it to the recheck area, where search agents can perform secondary inspection. The search agents also receive the annotated X-ray image and picture of each suspicious tray as all trays are identified with an RFID tag, which facilitates the inspection process. 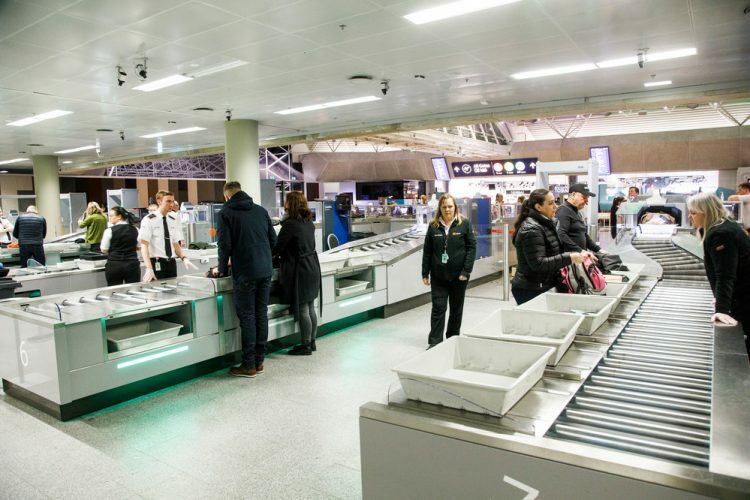 Once passengers have collected their belongings, empty trays can be automatically stacked at the end of the lane thanks to an Empty Tray Recognition System (ETRS). A tray return system then moves the empty trays back to the divest stations. All the data collected from the lane, the X-ray scanner, and other checkpoint devices is then gathered and archived on a server to be made available on web-based tools for reporting and monitoring purposes. This complete solution has recently been deployed at Keflavík Airport. One of Iceland’s major transportation hubs, the airport has faced a rapid growth in passenger volumes in the past 10 years, going from just over 3 million in 2013 to 9 million in 2017, and to an expected 10.4 million in 2018. With limited space within the terminal building to expand, Keflavík Airport turned to Vanderlande’s checkpoint solution PAX OPTIMA to improve the efficiency of their operations while maintaining their high security standards and improving the passenger experience. Keflavík Airport’s security area now comprises eight automated screening lanes integrated with centralised image processing. The successful integration of the solution and the constant increase in passenger traffic has also recently brought the airport to order four more lanes. In the case of Keflavík the lanes range from 17 to 19 meters, all lanes are equipped with straight parallel divestment stations, Empty Tray Recognition Systems, and RFID recheck workstations. A remote screening room was also deployed away from the lanes but within a short walking distance from the checkpoint to facilitate shift rotations. The implementation of automated screening lanes along with remote screening had a significant impact on the throughput at Keflavík Airport’s main checkpoint. Improved by more than 30%, the airport’s average throughput is now of 180-190 passengers per hour and of up to 260-265 during peak times. This performance increase also resulted in a better passenger experience, as 99% of passengers waited less than 10 minutes at the security area in 2017. Such an improvement was made possible thanks to process automation, but also to the use of the remote screening software functionalities. 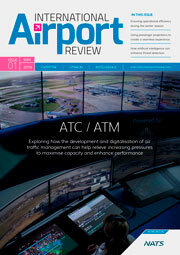 The software enables airports to adapt the agent-to-lane ratio depending on traffic variation at the checkpoint. This means that multiple screening agents can analyse images coming from a single lane in peak times, or that one agent can screen images coming from multiple lanes in slower periods. This capability enhances the use of staff resources, reduces operational costs, and allows airports to react more quickly to sudden changes in passenger traffic. Although throughput increase and operational efficiency were core concerns for Keflavík Airport, maintaining a high level of security was also a priority. Working away from the checkpoint’s distractions, screening agents can now focus on their tasks and identify potential threats with the help of a common and intuitive user interface. These enhanced working conditions were proven effective in previous deployments of PAX OPTIMA. Another international airport using the solution has seen an increase of 8% in the probability of threat detection and a decrease of 2 seconds for threat analysis time. Moreover, the deployment of centralised image processing also mitigates the risk for collusion and insider threat, as agents have no contact with the passengers, employees or crew members being screened. Today, Vanderlande is continuously working with Keflavík Airport to ensure that the systems in place are optimal and future-proof. Vendor independent and highly flexible, PAX OPTIMA evolves with the industry to comply with new regulations and new trends, providing customers such as Keflavík Airport with product upgrades and technological advances.